A community created wiki documenting details of all MCU series in all media and related topics. Official site from Marvel, with clips and bonus materials for the MCU as well as other Marvel movies, with and links for purchasing or viewing them online. This review site maintains this page with interviews, trailers, clips, and other materials promoting and evaluating the MCU movies. 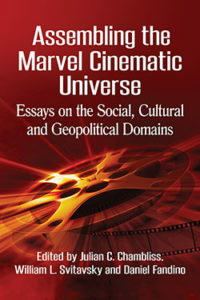 This page is probably the most convenient source of basic information on the creation and progress of the MCU, including a reliable list of the MCU installments in all media. Brooks Barnes, “With Fan at the Helm, Marvel Safely Steers Its Heroes to the Screen,” The New York Times, July 24, 2011. This website provides news, columns, and reviews covering both past and current comic books, as well as comics movie adaptations. This website provides news and reviews covering current comic book titles. A database of images and publication information for comic book series, built by volunteers. Probably the most comprehensive collection of comic book cover images available. A database of publication information for comic books including writers, artists, and other creators by individual issue or story. Volunteers register to contribute data. This feature on the site Mike’s Amazing World of Comics allows you to view the comics from many publishers from the month they were sold or with a specific cover date. (These are not the same thing; for many years, cover dates were deliberately later than the on sale date so that retailers would keep them on the racks longer.) Includes American comic books from 1934 until a few months ago. The comics journal has a long history as an intellectual magazine about comics. Their archives include many insightful critiques and creator interviews. A fairly extensive bibliography of books, articles, and other publications related to comics, cartoons, and animation, provided by John Bullough of the Rensselaer Polytechnic Institute. Provides historical sales and circulation data and statistics for American graphic novels and comic books reaching back to the 1960s. A 2015 survey of comics retailers from around the world. An extensive collection to links for comic book scholarship. Citing individual comic books can pose some unusual challenges. This site attempts to establish some standard practices for scholars. It is built primarily around MLA citation style, but its practices can be adapted for the Chicago style preferred by the Rollins history department. This subscription site offers digital access to thousands of Marvel comic books. An extensive collection of free downloadable files of comic books now in the public domain. An excellent opportunity to read a wide variety of early comics. Another extensive collection of free downloadable files of comic books now in the public domain. AFI’s website hosts a wide variety of information about their institution and the history of film, including a collection of lists designed to generate interest in America’s film canon. A comprehensive database of movies and TV shows, searchable by title; cast, crew, or character name; keyword; and more. This searchable database links to thousands of film reviews by professional critics. This site provides excepts a variety of films reviews from newspapers, magazines, and web publications, and tallies the average response to each film. A hub of information on the film, tv and video game scoring industry. It aims to provide composers interested in these areas with interviews with popular composers, music software reviews on the most popular sample libraries, plugins and VSTs in the industry, and a wide range of articles and tutorials on the many aspects of film/tv/game scoring. On the Score is a regular feature of Film Music Magazine featuring audio interviews with many prominent composers.